Tag Archives: Julio Cesar Chavez Jr.
Julio Cesar Chavez Jr. of Mexico on Saturday night won a unanimous decision over Bryan Vera in the super middleweight main event at the Alamodome in San Antonio. Former middleweight champion Chavez won the 12-round bout televised by HBO by scores of 117-110 (Ruben Carrion), 117-110 (Max DeLuca) and 114-113 (David Sutherland). The fight came about six months after their first fight, where an out-of-shape Chavez was scored a unanimous-decision winner of a 10-round fight at StubCenter Center that most fans and reporters thought should have gone to Vera. Chavez, who turned 28 on Feb. 16, is now 48-1-1 with 32 knockouts. Vera, 32, of Austin, Texas, is 23-8 with 14 knockouts. Orlando Salido of Mexico won a 12-round split-decision over Vasyl Lomachenko in the semi-main event. Salido (41-12-2, 28 KOs) was scored the winner by judges Jack Reiss (116-112) and Oren Shellenberger (115-113). The other judge – Levin Martinez – gave it to Lomachenko by a 115-113 count. Salido lost his featherweight title on the scales when he did not make weight Friday. He was not eligible to win it back Saturday. Only Lomachenko (1-1), of Ukraine, could have left with the belt. As it stands, that title will be vacant. Julio Cesar Chavez Jr. has the reputation of being a talented fighter not willing to train hard enough to be all he can be in the ring. His most recent fight was a classic example. That was Sept. 28 at StubHub Center in Carson against Bryan Vera. Chavez told his promoter – Bob Arum – the week of the fight that he would not be able to make the 168-pound super middleweight limit contracted for the fight. Since Arum is Arum and Chavez is the son of the legend, they proposed to Vera and his team that the fight take place at 173 pounds. Vera (23-7, 14 KOs), of Austin, Texas, was not about to say no. Arum and Chavez had to know that, because then the little-known Vera would not get the chance to upset Chavez, who is world-renowned whether he deserves to be or not. Vera gave Chavez (47-1-1, 32 KOs) all he could handle over 10 rounds, with the majority of fans in the stands believing he won the fight, based on their reaction when it was announced Chavez was the winner by two, four and eight points. Those last two scores – by judges Marty Denkin and Gwen Adair – were out of line, and an uproar ensued. Fast forward to present day. Chavez, the 28-year-old former middleweight world champion from Mexico, is preparing to take on Vera in a March 1 rematch at the Alamodome in San Antonio (on HBO). This week, he vowed things will be different. There will be no weight issues this time, Chavez said, and he believes that will help him show what he can really do. Julio Cesar Chavez Jr. of Mexico on March 1 will fight a rematch with Bryan Vera at the Alamodome in San Antonio (on HBO). The fight is slated to take place at the 168-pound super middleweight limit. Therein lies the intrigue. For their first fight, Chavez informed his promoter – Bob Arum – the week of that Sept. 28 bout at StubHub Center that he would not be able to make 168 pounds. The new weight was contracted for 173 pounds, two under the light heavyweight limit. We asked Arum on Wednesday if he has heard any news out of Chavez’s camp regarding his weight and how he’s doing with it. Arum came with an interesting response. Chavez (47-1-1, 32 KOs) won an unpopular unanimous decision over Vera (23-7, 14 KOs) the first time. Vera is from Austin, Texas. It’s good to see that Bryan Vera is getting another shot at Julio Cesar Chavez Jr.
Monday’s news that a rematch between Julio Cesar Chavez Jr. and Bryan Vera is a done deal for March 1 at the Alamodome in San Antonio, Texas (on HBO) was good. 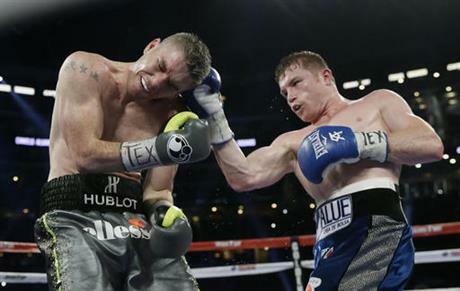 The two tangled Sept. 28 at StubHub Center in Carson with Chavez coming away with an unpopular unanimous decision. Vera fought the fight of his life, and Chavez was taken to task in a big way. Vera was the busier of the two, Chavez landed the harder blows. What really steamed many was two scorecards that seemed well out of line. Carla Caiz had Chavez winning 96-94. But Marty Denkin and Gwen Adair had Chavez winning by scores of 97-93 and 98-92, respectively. This was on the heels of Chavez being so unprofessional as to tell his camp the week of the fight that he could not make the 168-pound limit. Just like magic, Chavez and his team – including co-promoters- Bob Arum and Fernando Beltran – came up a new weight of 173. (Only in boxing, right?). Vera did make extra cash for agreeing to the change. But whatever joy he might have gotten from that quickly turned to misery when the scorecards were read following his gallant effort. Glad this rematch is happening because Vera deserves it. By the way, the contracted weight for this fight is again 168, the super middleweight limit. Let’s see if Chavez, the former middleweight champion from Mexico, can train hard enough so we don’t have to see boxing embarrassed again when he comes up with another new weight. Vera, 32, is from Austin, Texas. He is 27-3 with 14 knockouts. Chavez, 27, is 47-1-1 with 32 knockouts.